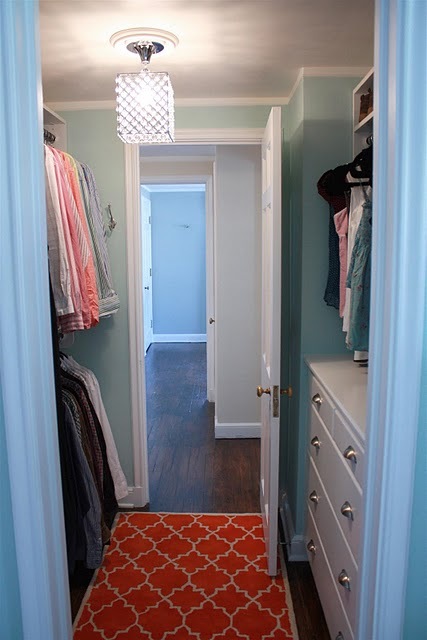 I LOVE seeing closets that are not only functional but full of sweet details. Sara at Russet Street Reno is a closet decorating genius! I know you are going to think that her dressing room and her newly decorated husband's closet are just as swoonworthy as I did. Check out this capiz chandelier, calming neutral paint & gorgeous curtains, not to mention a settee to sit down and put on your shoes. Oooh and the mirrored tray full of perfume is pure luxury here people! And look at that huge full length mirror. Sigh. The first three photos are her dressing room and the last three are her husband's closet. The greek tile rugs are so bright and cheery! Isn't the dress all set to go for wearing the next day a cool idea? It doesn't hurt that it is color coordinated with the decor. That is a lot of clothes, and only shirts! There's a stylish light in here too. I love the paint color. Look at the uniform hangers and color coordination! It looks like she might do some closet space sharing with hubby. Who says having a whole room for your closet is enough? 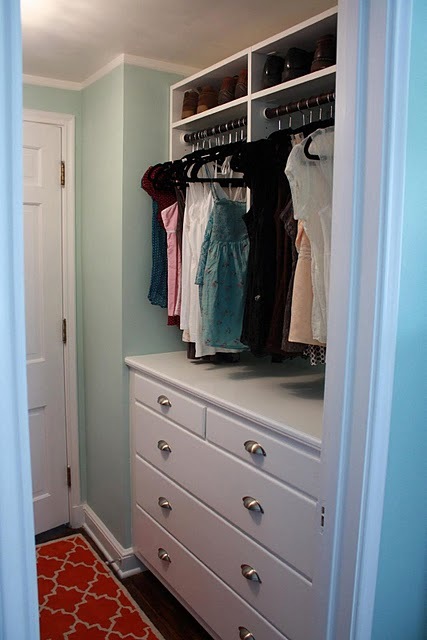 OK, closet lovers, what do you think of this beauty? Does it make you look at your closet a little differently? Who is completely inspired and mesmerized, like I am? Let's have some respect for our house of clothes and doll it up like the rest of our homes! That is awesome! Josh's aunt just moved here and I sent it to her before she has a room that she was going to dedicate as her closet. This makes it so pretty!! Hope all is well. Miss seeing you. 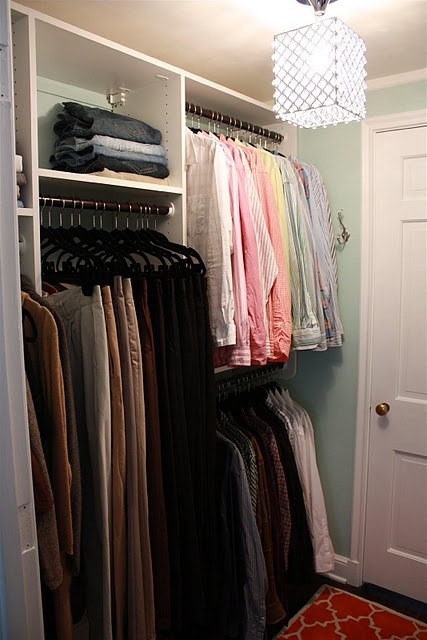 I definitely have a thing for closets--I even do a regular feature on my blog called Cool Closets. (http://girlonabike2.blogspot.com/2011/01/cool-closets-empire-strikes-back.html) Thanks for sharing this lovely one! I am loving these and am inspired. Instead of pining for a huge walk-in closet, why not turn an unused room (or area) into a fab creation. I particularly like the lighting fixtures and the rugs. These pictures are in my files for redecorating purposes later. Thanks so much for posting!! !